Offered for sale with NO ONWARD CHAIN and having far reaching Exe Estuary, Haldon Hill, Sea and South Devon Coastline views from the rear is this 1 bedroom second floor flat. This gas centrally heated (from combi boiler) and uPVC double glazed property comprises of open plan living room / kitchen with those far reaching views, dual aspect bedroom with Countryside views and modern fitted bathroom. There is a Balcony, again gaining those views and an off road parking space to the front. A brand new lease will be created upon completion. 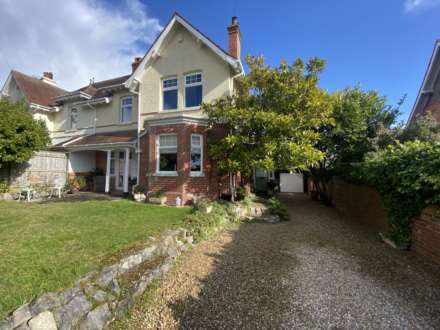 Situated in this semi - rural location, yet within easy access to Lympstone village and Exmouth, an appointment to view is advised. Radiator. Wooden flooring. High level electric meter. Stair case rising to second floor. An open plan room with panoramic Exe Estuary, Haldon Hill, Sea and South devon coastline views from the window and sliding patio doors that lead to the Balcony. Velux window to front gaining Countryside views. Radiator. TV point. Doors to bedroom and bathroom. Range of cupboard and drawer storage units with roll edged work surfaces, breakfast bar and tiled splash backs. Stainless steel one and a half bowl sink with single drainer unit and mixer tap. Built - in 4 ring electric hob with electric oven below and filter hood above. Space and plumbing for washing machine. Further space for fridge and freezer etc. Dual aspect having window to side and Velux window to front gaining far reaching Countryside views. Velux window tom front gaining far reaching Countryside views. Modern fitted white suite comprising panelled bath with thermostatically controlled shower unit over. Low level WC. Pedestal wash hand basin. Tiled splash backs. Heated towel rail. Shaver socket. Extractor fan.